Integrate your applications with Office 365 services such as mail, calendar, contacts, files and more. This extension will help register your application to consume Office 365 APIs, and will add the necessary NuGet libraries to get you up and running in no time. Office 365 API Tools enable developers to integrate Office 365 services such as mail, calendar, contacts, files, users and groups into their applications. It is now integrated with Office Developer Tools for Visual Studio 2013 - November 2014 Update. Once installed, Office 365 tools are available under your project node’s context menu in the Solution Explorer by selecting Add->Connected Service. Using this tool, developers can sign in to their Office 365 account and view the Office 365 services available to consume in their applications. 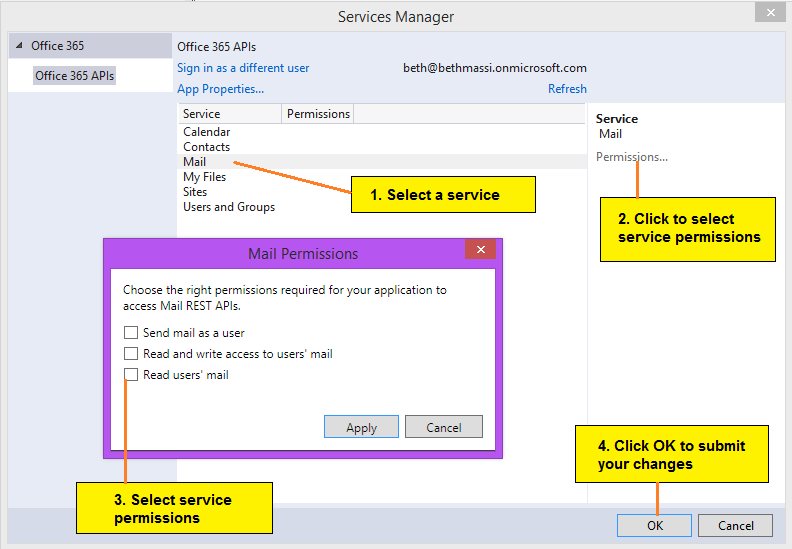 Once signed in with Office 365 credentials, adding a service to the project is as easy as selecting the appropriate service and applying the required permissions. Registers an application (if there isn’t an application registered yet) in Microsoft Azure Active Directory to consume Office 365 services. Adds client libraries from Nuget for the configured services to the project. Opens the getting started documentation page in your default web browser, which offers sample code that you can copy and paste to your project to use the client libraries. Your feedback about the tools and APIs is important to us. Have feature requests? Let us know on UserVoice. Have questions? Connect with us on StackOverflow. Tag your questions with [Office365] & [API].